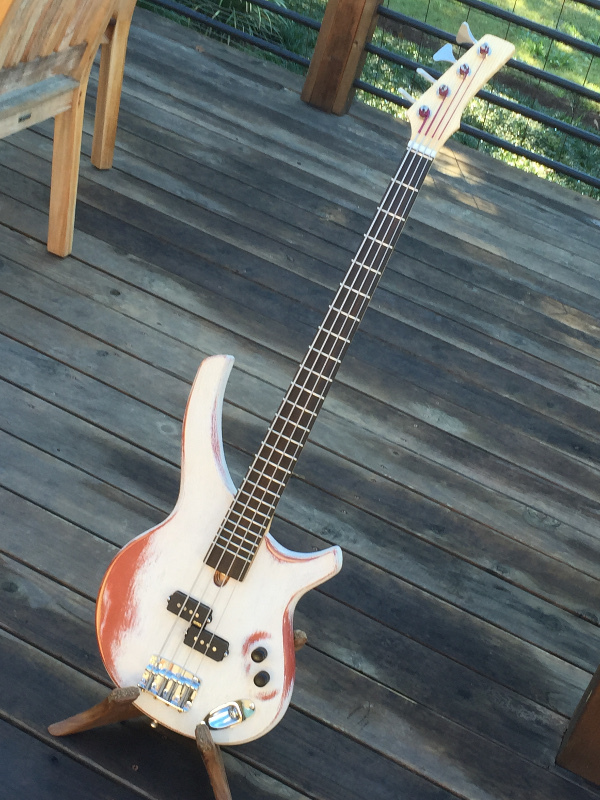 The short-scale bass concept is complete and we’ve started testing her. Love the EMG passive “Geezer” pickup. Simplicity at it’s best. No battery, just volume and a single tone control. Works well with the short scale, which doesn’t leave much room on the body. Body shape is very nearly perfect. It’s comfortable to hold. It rests nicely on your thigh when seated. Nothing seems out of place or uncomfortable. You barely notice the body at all, and that is exactly what we want. We will add a slight concave area to rest against the ribs and that will be it for the body. The neck is spot on. We went with a fast, narrow profile and it is excellent. The weight of the neck balances nicely with the body and the prominent grain of the Ash feels great under your hand and allows you to slide your hand with ease. We’ll probably try this on some of our semi-hollow ukes too because the prominent grain feels fast and not at all tacky. Overall size feels much more comfortable than a full-size bass (for us, anyway). A little stretch at the first position but still plenty of room up at the 24th fret. The ergonomics are dynamite for our first full prototype. Very comfortable without being too weird-looking. We’re very happy with the hardware. Tuners, bridge, pickup, knobs, jack…everything feels just right. Not to much bling…just simple and businesslike. We’ve decided on GHS Stainless Steel Precision Flatwound strings. They give us the tone we were looking for and they feel great on our fingers. Thanks to Jonathan Moody at GHS for setting us up with a selection of strings to test. The shorter scale narrowed the strings enough that we’ll need to angle the pickups slightly to better align the magnets with each string. 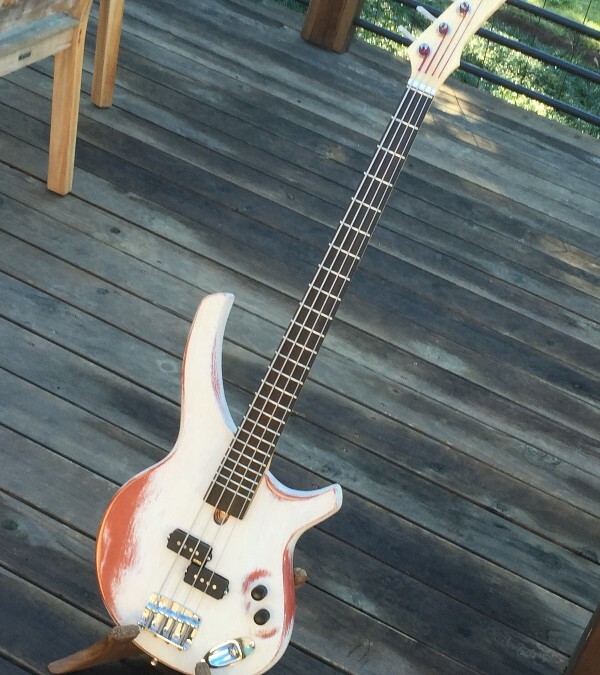 We used a standard p-bass template for the pickups and the spread is too wide for our shorter scale. Very slight concave area to be added to the back between the upper and lower bouts along the top edge. We didn’t notice any discomfort there, it just looks like a fairly small contact area so we want to make it a bit larger to prevent any issues from developing during long sessions. We’ll be adding some copper shielding inside the body cavities to shield the electronics. We were planning to do this as soon as we finished the prototype but since we’ll be retiring this body we’ll wait until version 1.1. So that’s it for now. We love the scale length and the ergonomics are very, very nice. Hardware and strings are settled and now it’s just some very small tweaks. Groovy! Can’t wait to hear it in person!! This thing is the perfect size Bob. Still a bit of stretch at the first position but definitely manageable. But the reach is much better and the upper frets are very accessible. It is just too fun!